What does the SuperBowl mean to me? Cooking. Lots of cooking – which, let’s be honest, usually means I get to my Super Bowl parties around halftime. ‘Cuz with a friend in town, a brunch date and 2 parties to attend yesterday, that doesn’t leave a girl a lot of time. Hence, I whipped up two of my #QuickieQuarterback dishes, beginning with this one. And, y’all, it was a hit with guys and girls alike! Reuben Beer Dip with rye crackers. You heard me. Yep. Reuben sandwich in a bowl. And it was delicious. It was SO good, my friends didn’t even mind a bit that I was late to the festivities, and it even brought a little post-Halftime glee. Dawn Do? Try putting dippers, that accompany dips, in muffin tins. Perfect for separating and showcasing dippers for impromptu entertaining! Place mixture in a baking dish, cover with foil, and bake at 350 degrees for 30 minutes. Serve with dipper and enjoy! p.s. How much do we love that southern dishtowel? My sweet neighbor, Hope, gave it to me for my birthday! 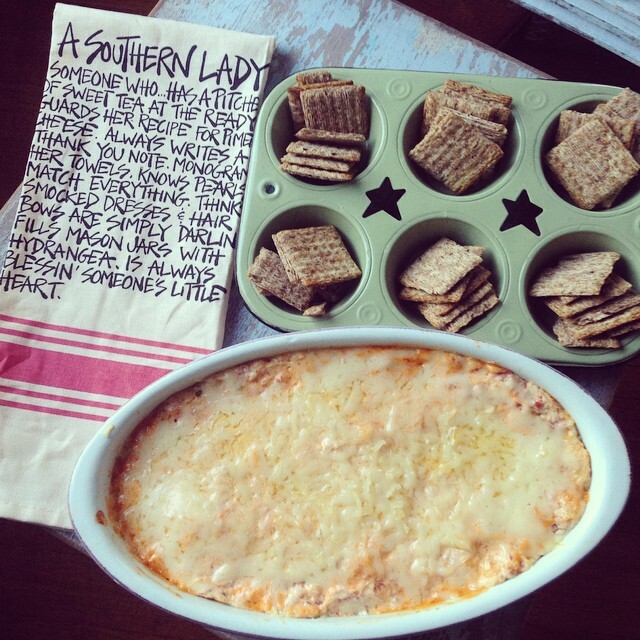 BF Asks: What’s your favorite SuperBowl or tailgating dip recipe? Hosting a party and need a quick, no-cook dessert? Have a salted caramel lover in your house? Then, look no further than my homespun recipe, Salted Caramel Brown Sugar Dessert Dip. For those of you BF readers who don’t know, a “homespun” recipe is when you make something that’s not from scratch taste like scratch, just by spinning a few homemade-tasting ingredients in there. For this easy dessert, it’s creamy, dreamy, and perfect when served with ginger snaps, Granny Smith Apples, strawberries and jumbo marshmallows as dippers. Set aside 1 Tbsp of salted caramel dip. Combine all ingredients in a mixing bowl, using a hand mixer. Transfer into serving dish, making sure to use a spatula to make the top look extra smooth and “frostingy”. Drizzle the remaining 1 Tbsp of salted caramel dip on top. Put in center of platter and surround with dippers, including ginger snaps, Granny Smith Apples, strawberries, bananas, mini chocolate bars and jumbo marshmallows. 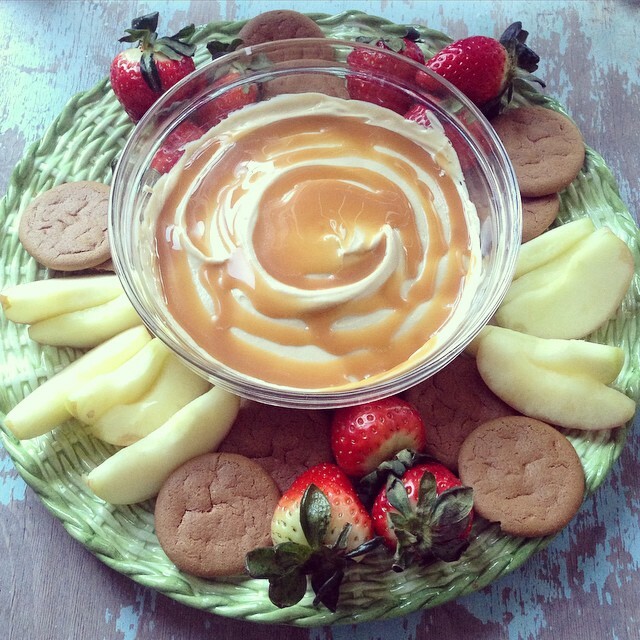 BF Asks: What dippers do you think would go best with my salted caramel dip? Fast, easy way to decorate a bakery-bought cake? Christmas cookies. 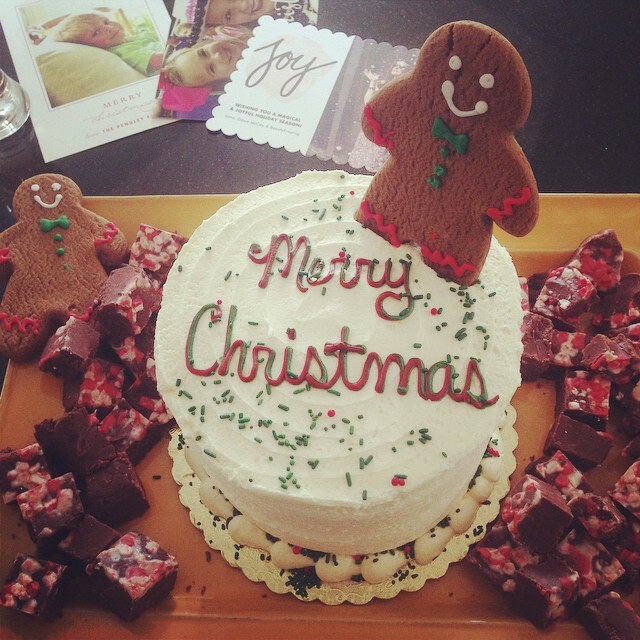 BF Asks: How do you “holiday up” your desserts? What’s a super simple and cheap way to dress up your festive holiday pies? FLOWERS!! 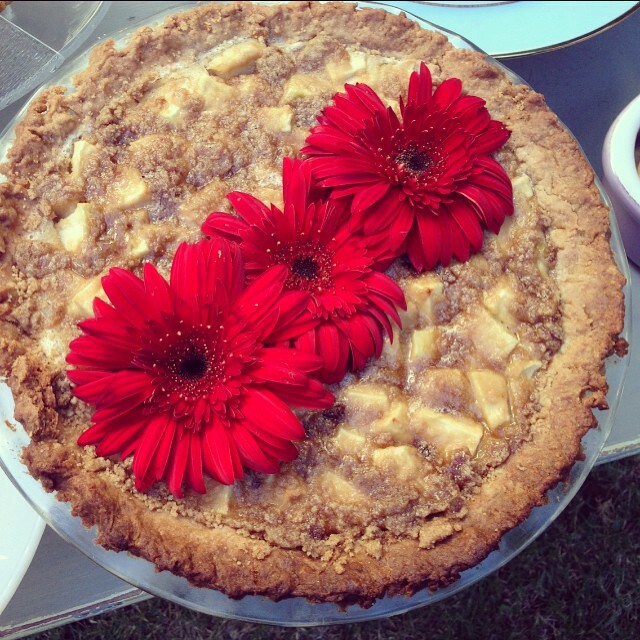 Here is my sour cream apple pie – not so beautiful on its own – that I topped with some holiday red gerber a daisies for Thanksgiving dinner. Instant americana beauty! I’ve found that just buying a few extra bunches of flowers can come in handy when dressing up desserts or sad looking pies. Try it yourself this holiday season! 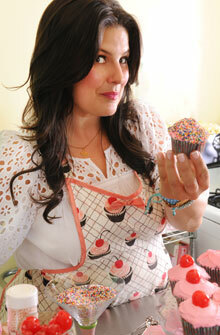 BF Asks: What pies will you and your family bake up this holiday season? Now, isn’t THAT the sweetest? Oh, how I love a tea party! And for me, no tea party is complete without tea sandwiches – or finger sandwiches – as they used to be called in Dallas from which I hail. 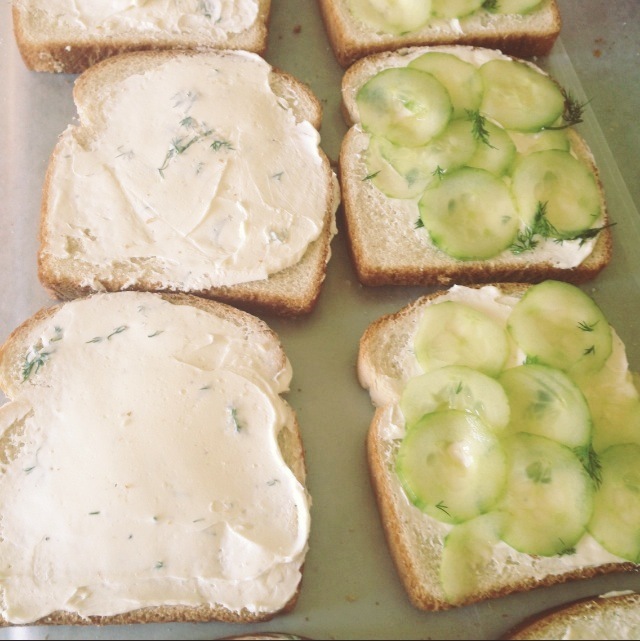 So when I hosted a “sprinkle” tea party for a good friend a few weeks ago, I simply had to include a few dozen of my Cucumber Dill Cream Cheese Finger Sandwiches. Now, here’s the recipe so you can whip some up for your next tea party! And remember a tea party doesn’t have to be a formal affair! It can be as simple as inviting over a friend you haven’t caught up with in a while and sipping a cup of cream tea and enjoying a sandwich. You know me…life’s all about those daily delights. In a bowl, combine cream cheese, lemon juice, dill, garlic salt, salt and pepper. Prepare a sandwich work station by laying out two long strips of wax paper. I usually cover my stainless steel bar to do this. Lay out 12 slices of bread. Coat each slice of bread with the cream cheese mixture. Cover 6 slices of bread with your thinly sliced cucumbers. Top with the remaining bread. Cut off crusts and cut into quarters. I prefer triangles or rectangles depending on the shape of the other sandwiches I’m making. Serve immediately or chill until ready to serve. *BF Tip: If you have to wait to serve, layer damp, wrung-out paper towels between each layer of cut sandwiches. These will keep the sandwiches moist. Enjoy with your favorite cup of tea! Personally, I prefer a cream tea with sugar cubes! 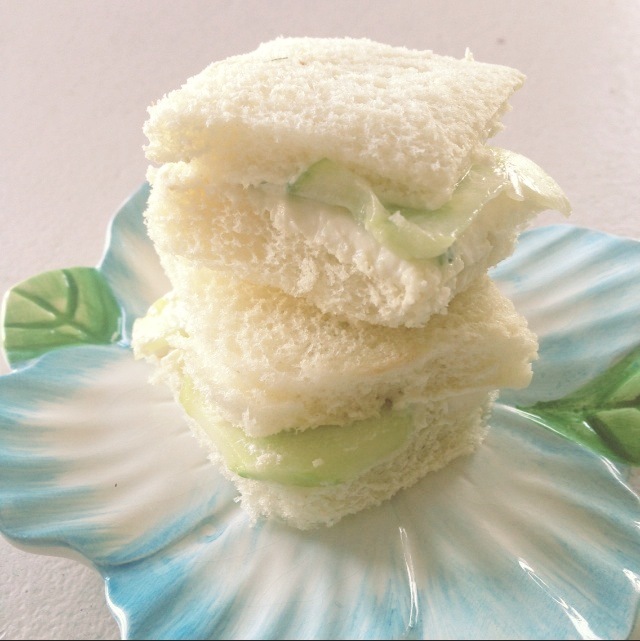 BF Asks: What’s your favorite finger sandwich or tea sandwich to have at a tea party? Last Thursday, I had a photo shoot here at The Cupcake Palace and, well, I wanted to socially lubricate myself a bit with a mid-day cocktail for the shoot. Don’t judge. I only had one and I must say it did make me feel a bit more photogenic. I looked in the fridge for inspiration and inspiration found me: Dole Pineapple Juice, One Hope California Brut Sparkling Wine ($19.99) and Ole Smoky Moonshine Cherries. Add a little splash of vanilla extract (which chronic bakers like me always have on hand) and thus, this week’s Thirsty Thursday concoction was born. So here is my little Pineapple Upside Down Cake Champagne Cocktail for you to enjoy – before a photo shoot, a fun-filled day or maybe even just while soaking in a foam-filled tub. Grab your favorite champagne flute (or, I suppose, a regular cocktail glass will do). Drop in a moonshine cherry at the bottom. Fill with 4 ozs pineapple juice and top with 4 ozs champagne. Add a splashStab a cherry with a party pic and place on top or rest on side of glass. Pineapple Upside Down Cake Champagne Cocktail in a glass. 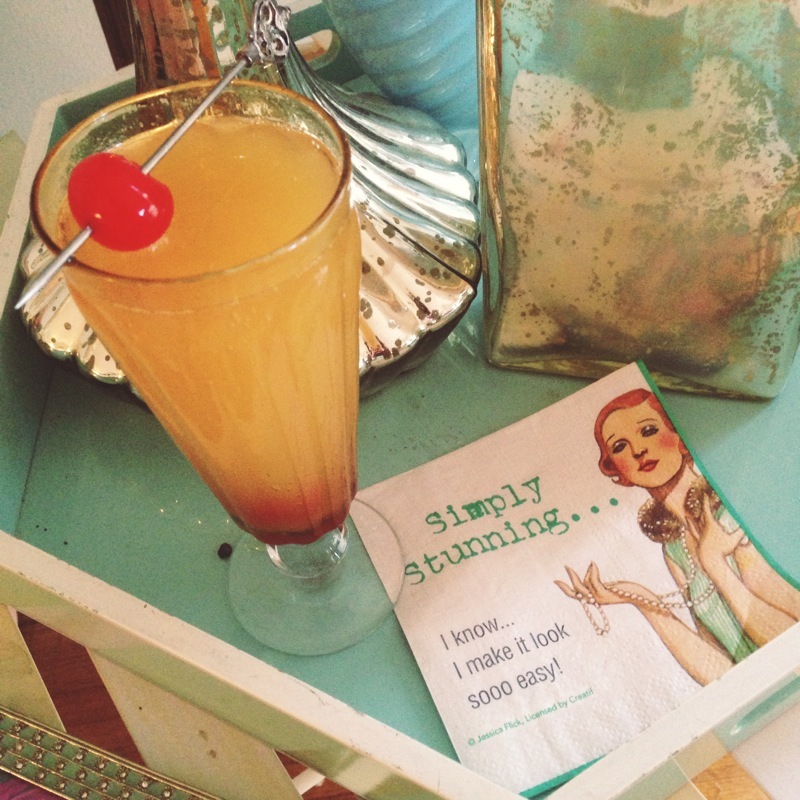 BF Asks: What was your favorite drink or punch this week? Oh, how I love award season! It has filled me with glee, delight, suspense and excitement ever since I was a tiny girl! So you can bet I’ll be glued to the screen this Sunday night to see who will be taking home the coveted Golden Globes this year. 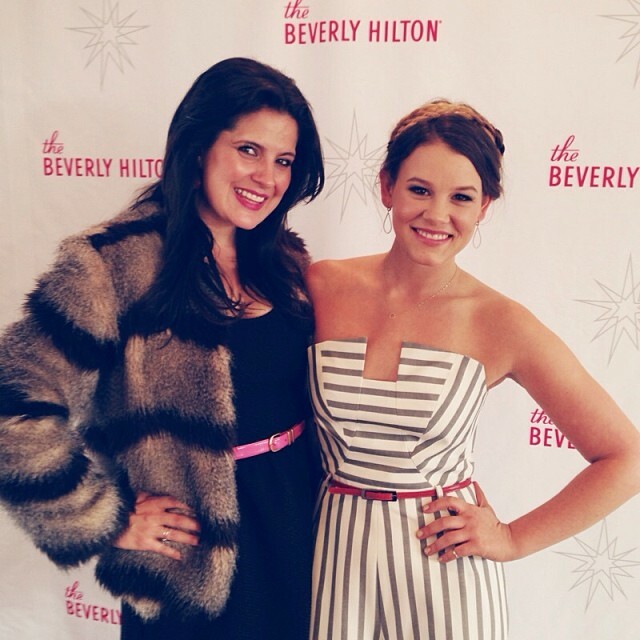 I had the pleasure of attending a Golden Globes luncheon at the Beverly Hilton this past Thursday to meet and chat with Miss Golden Globes 2014 herself, Sosie Bacon. The official cocktail of the 71st Annual Golden Globe Awards that they served sent me over the moon. 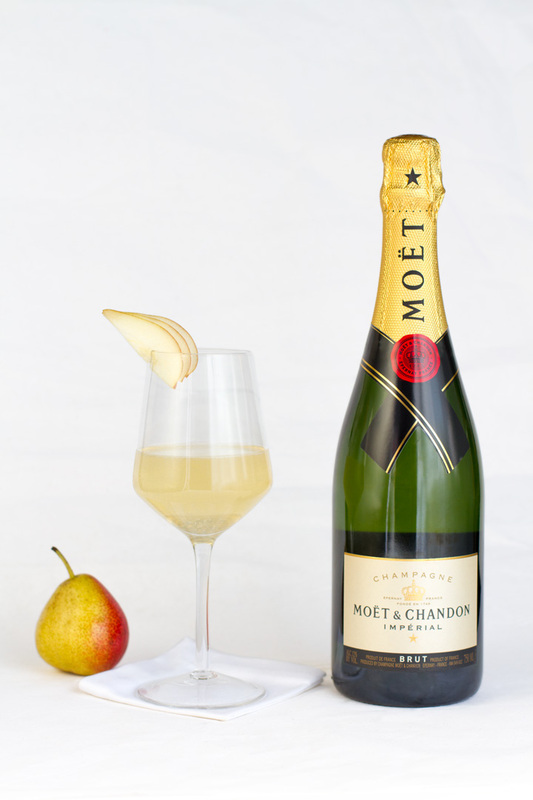 Moët & Chandon were kind enough to share Aida Mollenkamp’s delicious recipe with me so I might enjoy it on Sunday while watching. And being me, I of course have to share it with you! I hope you enjoy it as much as I did on Thursday – and be assured that I will be enjoying it again come Sunday! 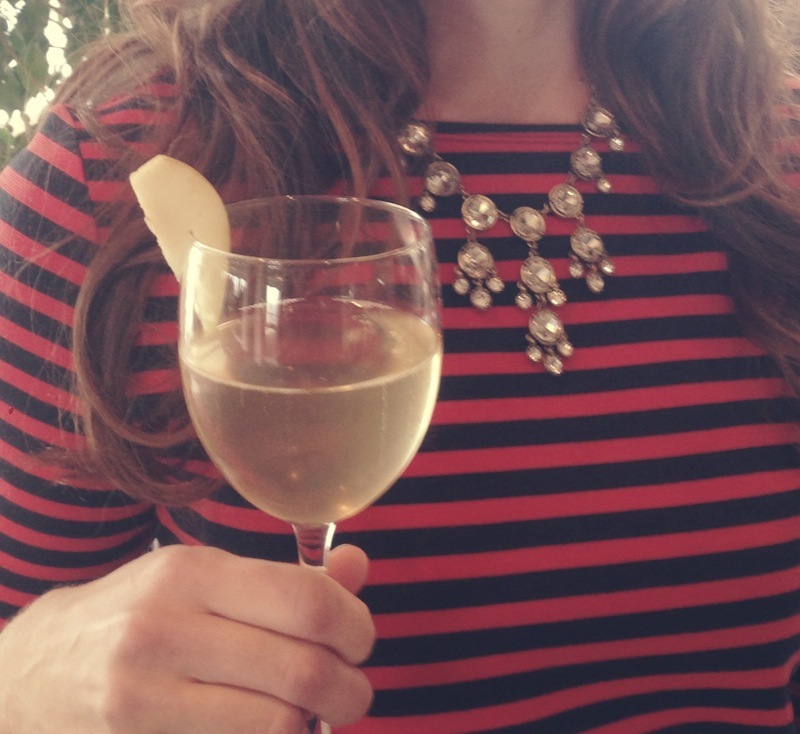 BF Asks: What will you be snacking on & sipping come Sunday night? Happy New Year, my friends! I just got back from the best New Years Eve I’ve ever had – more on that later – but for now, I have to share my annual New Years tradition with you guys. Even with a well-earned hangover, I had to make this happen today. Hope your 2014 is off to a beautiful start! Me? I’m just eatin’ my blackeyed peas, chilling out, watching some movies and catching up on some tv. I’m long overdue for a little R & R.
As a southern girl, I fervently believe in the power of blackeyed peas…and I don’t mean the band. 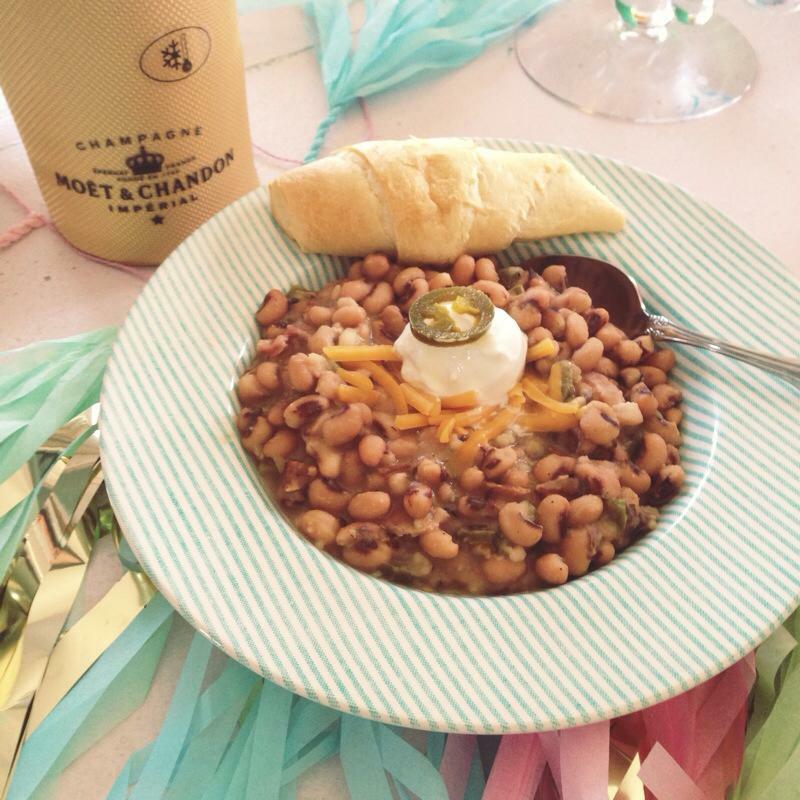 My annual New Years tradition: Blackeyed Peas with jalapeños, bacon, a crescent roll and champagne! Every year I cook a big pot of blackeyed peas with bacon, jalapeños, jalapeño juice, salt, pepper and a bit of butter and then top ’em with a dollop of Daisy sour cream and sharp cheddar. I serve em to my friends with crescent rolls or biscuits and champagne and, in honor of my Papaw, I always have a bit of buttermilk with em too. They are delicious and southern folklore says it grants you prosperity. Each year gets better and better so it must be workin’. Bring it on, my little blackeyed friends!! And may 2014 bring YOU prosperity!!! BF Asks: What is your New Years tradition? When I was trying to decide what my signature cocktail would be for my “Come As You Were…or WISH You Were In High School” birthday party, I was a bit overwhelmed. I wanted it to involve the bubbly (I mean what’s a birthday without champagne), have a wintry component (because my party this year was sandwiched between a slew of holiday parties) and be something that my guests would never forget. That’s where One Hope Wine and Hope at Home stepped in to help. 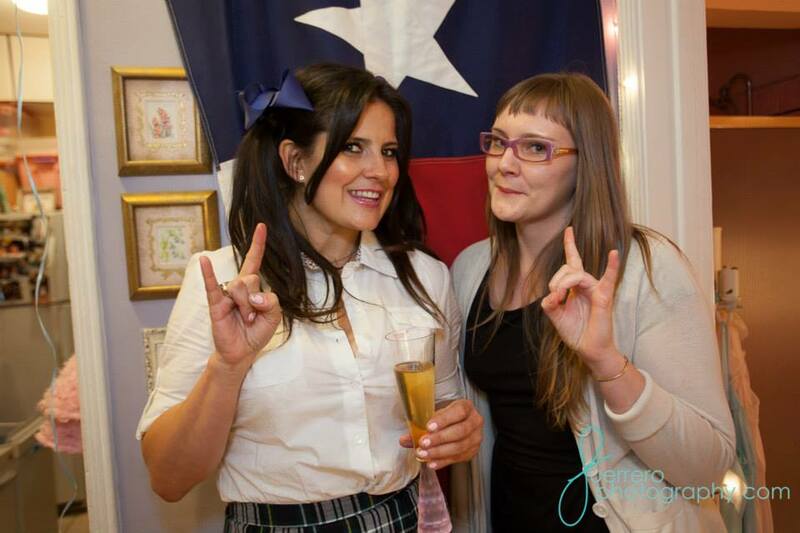 One Hope Wine & Hope At Home saved that day…well, at least my party! 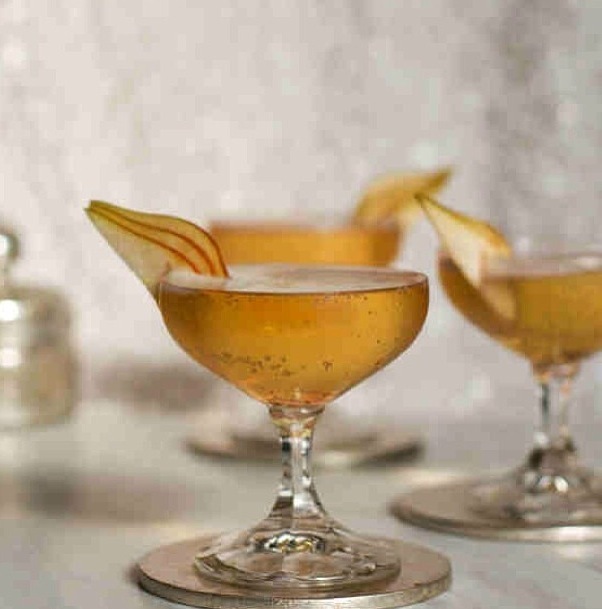 They have a slew of cocktail recipes and fab pics on OneHopeWeddings.com where you can find the PERFECT cocktail to accompany your perfect party. For mine, I opted for the Apple Cider Mimosa. But to make it my own whimsical winter wonderland-fitting libation, I “tweaked” it a bit by substituting Captain Morgan Spiced Rum in place of the scotch. And you know what really made me feel good about it? 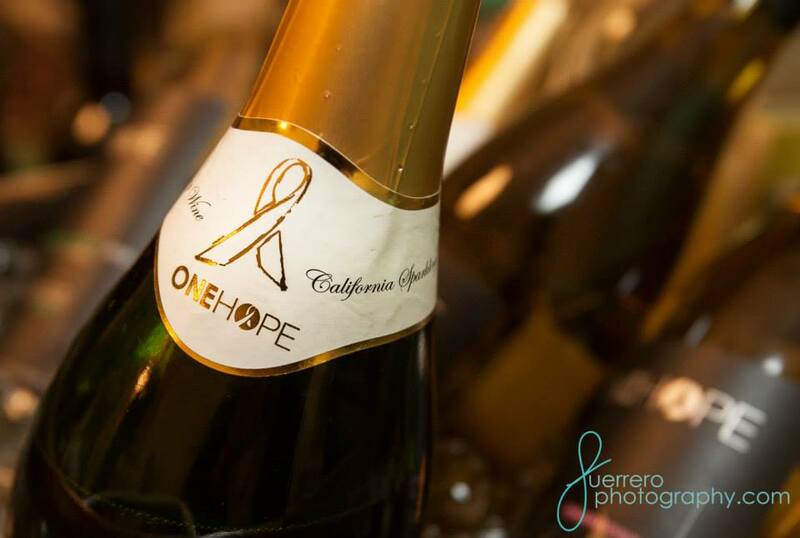 For every bottle of One Hope California Brut Sparkling Wine ($18.99) sold, a hungry child is connected with 10 healthy meals. Drinking for a good cause? 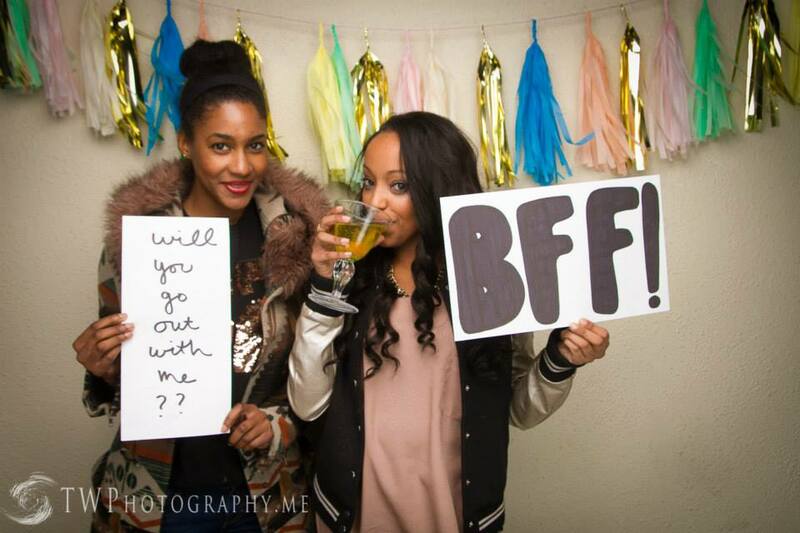 It’s like two of my favorite things on the planet just married one another. It. Was. Perfect. Everyone was raaaaaving about it and asking for the recipe. Yep. It’s exactly what I wanted. So now you can enjoy it at your holiday or winter party! If you need a little extra party guidance, Hope At Home has you covered. See, Hope At Home is magical when it comes to making a party pop. They offer private wine tasting parties where 15% of the sales go back to the non-profit or school of your choice. What could be a more fun – and philanthropic – way to celebrate this holiday season? And what a fun way to raise funds for your organization!! Combine brown sugar, spiced rum and apple cider in a flute. 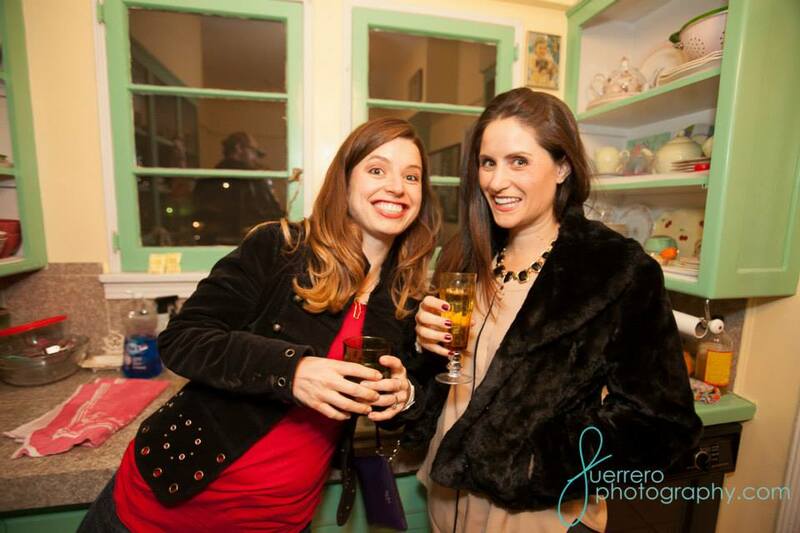 BF Asks: What charity, school or organization would benefit from your Hope At Home wine tasting party?